With it being the TEN year anniversary of Mean Girls this month I thought I would do a whole post dedicated to the classic movie we love and have grown up with! I was 14 when Mean Girls came out and of course was as obsessed with it then as I am now! Hilarious, girly and one of the quotable movies of the last 10 years for sure, Mean Girls has gone down in history as one of the best teen chick flicks of all time!
" On Wednesday's We Wear Pink " - a phrase uttered by probably all of us at some point over the last decade - so I thought to myself..... why not honour The Plastics and share a post of a few gorgeous pink items I have spotted out there on the high street at the moment! Ooo, I love everything, especially the bag. I love the nod to Mean Girls! The Kate Spade watch is so pretty! I love the skirt, it reminds me of the Grease theme. Oh my gawdddd no way is Mean Girls 10 years old - that film was my lifeeee!! Aah. 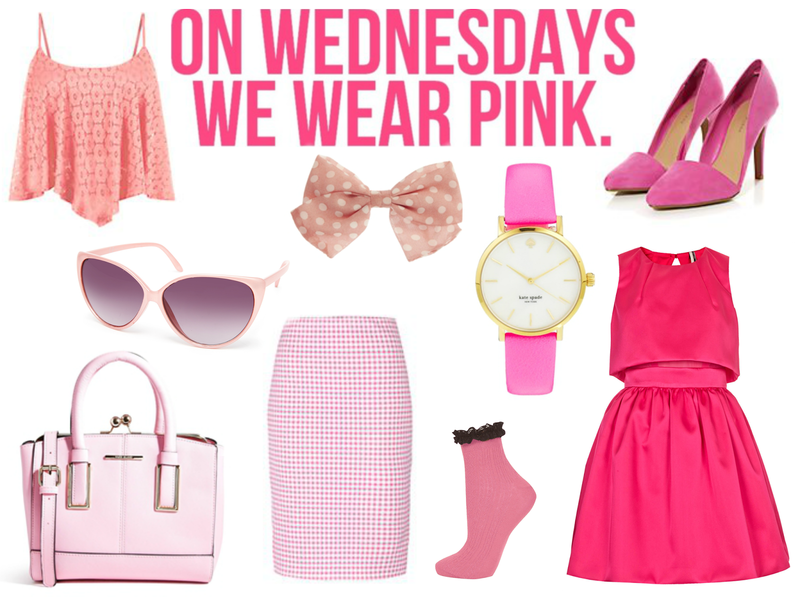 I don't usually wear pink, but I'd totally make an exception for that bag and those sunglasses!